This shamrock tie tack has been hallmarked 10K gold by the Irish Assay Office at Dublin Castle in Ireland. This handsome shamrock tie tack with inlaid Connemara marble is an unique piece of men's jewelry. 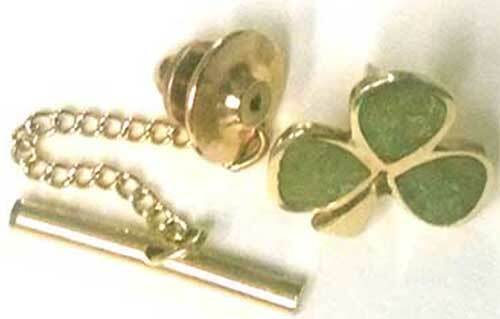 The 10K yellow gold shamrock tie tack measures 5/8" wide x 5/8" tall and includes the pin holder, a 1 1/2" long chain and a 7/8" long fob. 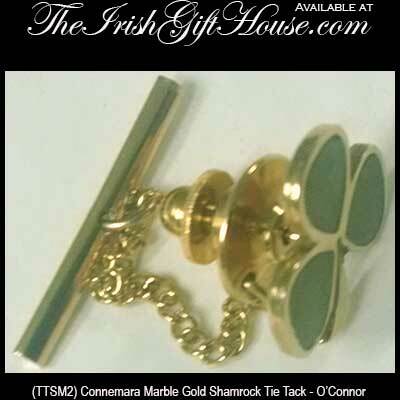 The Irish tie tack was made in Ireland by O'Connor Jewelry and is gift boxed with shamrock and Connemara marble history cards, complements of The Irish Gift House. The gold shamrock tie tack with Connemara marble is a one of a kind piece that was commissioned by The Irish Gift House and we only have one remaining.